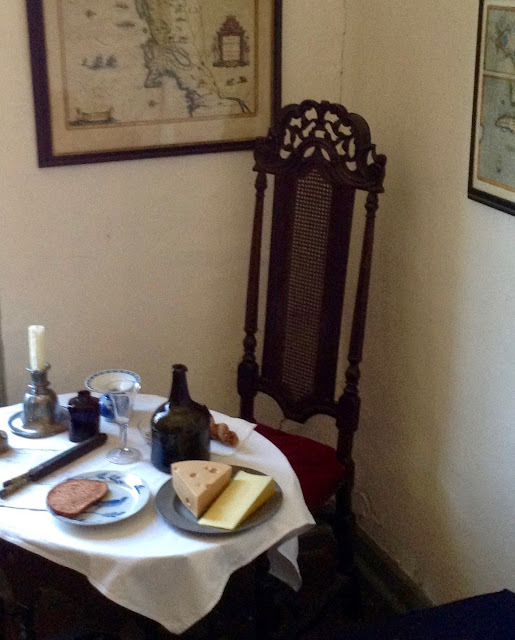 It’s 1745, you’ve had some economic success in life—comfortable, not wealthy—and you’re dressed in your best waiting for your guests to arrive, so you take a seat. 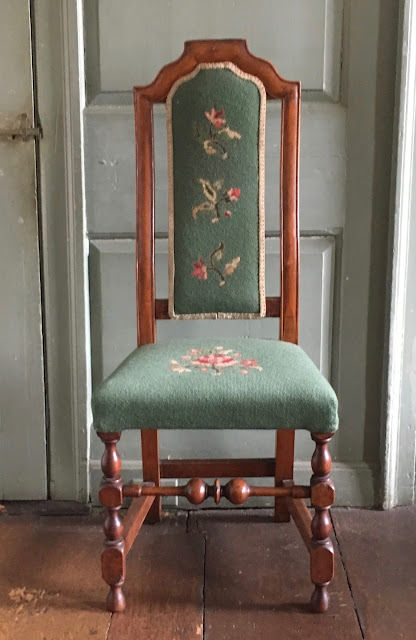 Despite the arrival of the cabriole leg in the 1730s and its acceptance into the design hierarchy, in all probability, you would still be using a chair like the one covered in 20th century needlework. Produced in Boston for the better part of 40 years, shipped throughout the colonies and copied by craftsmen in those same colonies, this chair in its many iterations defined its period. Its shape firmly links the design aesthetic of the Restoration Decades (1660-1714) with that of the long Eighteenth Century (1714-1837). The seat and legs reflect the turning traditions of hundreds of years, while the curved back introduces the modern notion of seated comfort. 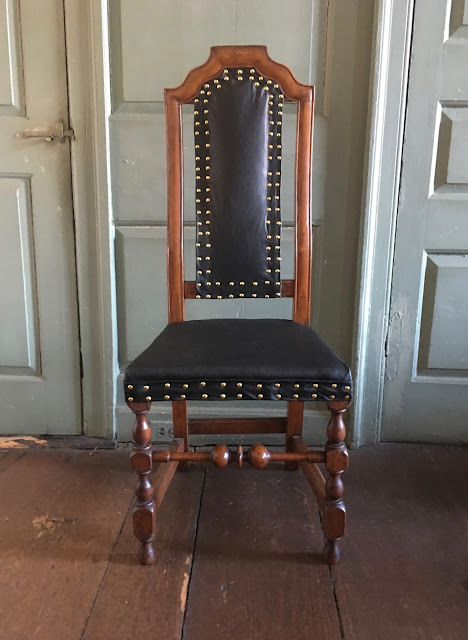 And with the addition of “elbows” or as we term them “arms,” them a truly modern notion of comfort begins to eclipse the stool and straight back chairs that predominated the 17th and early 18th centuries. The needlepoint chair is an object in the collection of the Warner House in Portsmouth, NH. For some time it was relegated to storage. Stylistically it was viewed as more Colonial Revival than 18th century—it no longer seemed to fit into the presentation of the house. Several years ago we began to reaccess the presentation of the house and this chair moved from storage into a 19th century bedchamber. It looked vaguely late Victorian in its upholstery and fit into the 19th century bedchamber that displayed several generations of furnishings. Personally, I liked the chair, or at least the structure of it, despite its upholstery. In the accession file from the 1960s it is listed as an 18th century chair, but in the wrong clothing even an authentic piece looks more like a reproduction than an original. One day we examined it from the side and realized it was likely an 18th century Boston chair covered in fabric, not leather. After a good bit of research and curatorial conversation it was decided to remove and save the needlework, and then replace it with black leather. The wood bears no traces of black paint, so the black leather was probably the correct fitting for such a chair. Black paint is indicative of red leather coverings, but like all historical decoration rules, absolutism is for the court of Versailles and some divergence for the rest of us. Due to its age and condition, the brass nails where place into or next to what appears to be the earliest pattern (new nails were inserted into old holes to determine the potential placement). 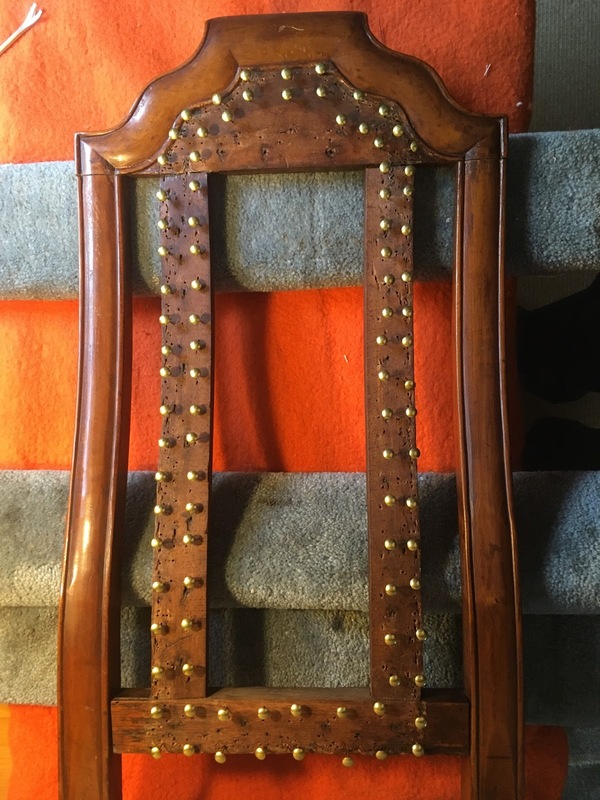 The back of the chair appears to have had nails placed about every inch, and the seat skirting about every 1.5 inches. Following these old nail holes meant that the placement was not perfect. Due to the nature of leather a hole made is a whole kept, so the double nailed pattern is close, but not mechanical. To visually and physically flatten the seat, excess cotton padding was removed. Both the seat and the back had horsehair stuffing, which was reused, keeping with upholstery practices of the 1730s-40s. Resting nails in old holes to determine placement. The curving of the back can be seen on the side rails. The leather is new and the solid brass nail heads gently glisten. The nails are old stock from 25 years ago and having mellowed give the chair a sense of being neither new, nor old, but accustomed to its house. As it appears now, it is a very evocative object—a piece of material culture that visually captures the stylistic backdrop of the 2nd quarter of the 18th century—a bridge between the Restoration and Georgian design cultures—a grasping by the burgeoning middle-class toward a more commodious life. Not to wax lyrical, but every now and then an object personifies an era, such is this chair for me. Jeff Hopper is the Director of the Warner House and researches social history and material culture. In this instance he used his old skills as a conservator to reupholster the chair closer to its original appearance.